All transactions are safe and secure with a reliable history in online purchasing behind each of our associates. Buy the Everdeen & Hawthorne Hunting Co. t-shirt to own Hunger Games clothing and merchandise. Gale Hawthorne, portrayed by Liam Hemsworth in the Hunger Games movie, was Katniss Everdeen's closest friend. Gale, who is two years older, also lost his father in the District 12 mining explosion that killed Katniss' dad. The two often hunted together until Gale went to work in the mines in Catching Fire. Jealous over Katniss' publicized "relationship" with Peeta, Gale reveals his feelings for Katniss by unexpectedly kissing her in the woods. Support him with this or a Hunger Games Team Gale t-shirt. 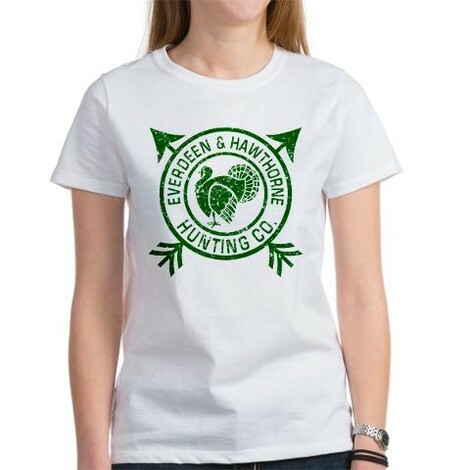 In addition to the Everdeen & Hawthorne Hunting Co. tee above, browse the Hunger Games Clothing Gallery for more apparel like men's and women's clothes, kids shirts or hoodies.